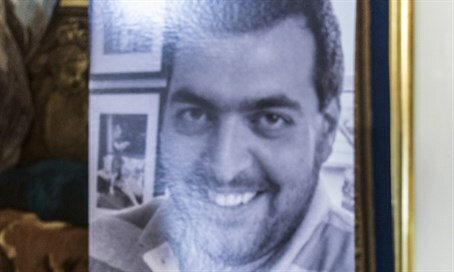 Dan Uzan, 37, died protecting 80 Jews in Copenhagen's main synagogue. The Danish people have chosen a Jewish terror victim as 'Man of the Year 2015': Dan Uzan, a 37-year-old volunteer security guard murdered in the February 2015 Copenhagen attacks. Readers and a panel of seven judges from the popular Berlingske daily announced the choice Tuesday, with the Editor-in-Chief presenting an award and the honor to Sergio (Mordechai) Uzan, Dan's father, who is also of Israeli origin. Dan's sister and mother were also in attendance. In February, Uzan was murdered by 22-year-old Palestinian-Danish man Omar El-Hussein as he guarded a Bat Mitzvah in the main synagogue of the Danish capital with 80 people inside. El-Hussein shot Uzan as the latter jumped in the heavily-armed gunman's path, unarmed. The attack shocked the country's tiny Jewish community, which numbers just 6,000-8,000 people. "Dan Uzan is a shining example for all of us," Denmark's Ambassador to Israel, Jesper Vahr, told Walla! News. "We must stand firm against terrorism, in all its manifestations." Uzan was previously posthumously awarded the French medal of courage for his incredible bravery.